Well, I’m now writting the lectures for the EMCORE Conferences for Hong Kong, Melbourne and Fiji and I was quite excited about this content and wanted to share some of it with you. Today I wanted to spend a little time talking about one of the three things I’ll be discussing at the EMCORE. This discussion refers to the adult non-trauma patient. Let’s for a moment picture the sick patient with shortness of breath. How are they sitting? Many would be tripoding with face forward. They are certainly not in the traditionally taught ‘sniffing position’ ie., with flexion of the lower C spine and extension of the atlanto-occipital joint. This is a position where over-extension can result in a more difficult airway. Greenland et al (1) found that different head and neck configurations had significant implications on the visualisation of the airway. This study found that a more horizontal placement of the face may improve intubation. The optimal position for laryngoscopy was found to be neck flexion of 35° and face plane extension of 15°. What this means is, that head elevation becomes important. I’ve demonstrated many times in our airway workshops, that if the laryngoscope blade is inserted into the vallecula and then the head lifted, with the laryngoscope, a better view of the cords results. This was very well illustrated in this study. Greenland K.B et al. 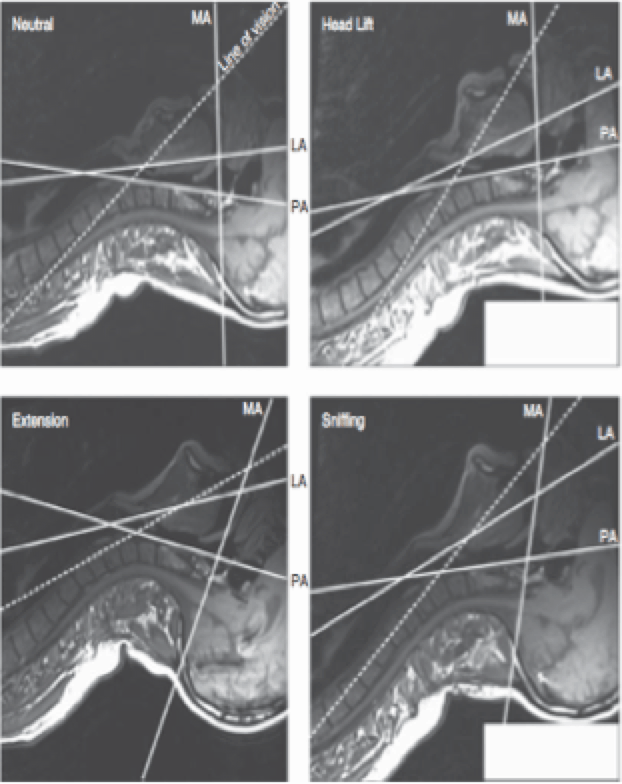 Changes in airway configuration with different head and neck positions using magnetic resonance imaging of normal airways: a new concept with possible clinical implications. British Journal of Anaesthesia. 105 (5); 83-90, 2010. The external meatus reflects the position of the clivus and the sterna notch reflects the position of the glottis opening. I will repeat that this positioning is not for a patient with suspected cervical injury. To obtain the optimal positioning, the head must be raised so that a horizontal line can be drawn between the external meatus and the sternal notch. This same positioning works extremely well for the morbidly obese patient. It does away with the need for ‘ramping’ the patient, so they are head up. It also does away with the need for a stubby-handed laryngoscope.